A friend and I attended a recent landscape exhibit. Coincidentally my friend introduced the idea that a painting should be interesting at 60 feet, at 6 feet, and at 6 inches. I thought it an interesting idea and decided to put it to the test as we viewed the show. As we entered the large hall several of the paintings immediately caught my attention. One of them, a large painting of a river winding its way around a massive red rock by Conrad Buff, practically shouted to come hither. It passed the 60 foot hurdle. As I got closer the structural rhythms and lines became more noticeable and formed an energetic and varied composition. Even more intrigued I yearned to observe the painting even closer. From just a few feet away the lively brushstrokes and crosshatched patterns of color gave me the anticipated payoff. There were other paintings that gave a similar experience. With few exceptions these were the paintings I enjoyed most. So what was the phenomenon that was engaging me and giving such visual satisfaction? I came to the conclusion that at 60 feet a viewer can only see the most basic, abstract patterns. If this pattern is contrived by the artist to create an interesting motion and variety of interlocking shapes the painting communicates to viewers the possibility that on closer inspection they will be further rewarded. At 6 feet viewers find it difficult to see the large pattern and begin to see the finer detail of composition. They began to see linear detail, and by this I mean the lines formed by adjacent shapes, as well as linear aspects that are created by shorelines, rivers, trees, and other forms. If this consortium of lines causes the eye to wander and dart through the two-dimensional space in a pleasing manner viewers are again rewarded and tempted to get closer still. 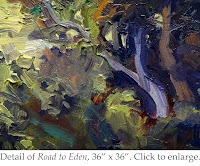 Finally, as viewers approach the canvas within a foot or so they see the texture of the paint marks and brush strokes. At this level the viewer is again immersed in an abstract world. If this abstract world has a conscious structure the viewer is again rewarded by connecting with the artist's original intention. What we experience as we approach a painting is a shifting series of presentations and interpretations which create an interplay of anticipation and satisfaction. Of course not every painting has to fulfill the viewer on every level. But on this occasion the paintings that fulfilled this three-tiered expectation were the most satisfying. I concluded from this experience that I need to present to the viewer a strong abstract pattern at 60 feet. I need to present a rhythmic and visually pleasing linear composition at 6 feet. And at 6 inches I need to deliver an undulating interplay of interlocking texture. hmmm. I keep having trouble posting comments to your blog and not sure why.I think it's just because I wasn't signed in. Bascially I wrote that as a children's book illustrator I tend to think about this issue differently. Not a whole lot of people will be viewing my original art at all much less from various distances. So for me my main concern is allways about trying to imagine how the larger illustration will look when reproduced at a much smaller size. Previously i have allways taken pictures of the art at various stages and then view it on the computer which gives me an idea of the size it will be in the book. Since reading you blog discussing reducing prisms, mirrors etc. I think I will buy one and try that method. In art school teachers allways told us to step back from our art every so often to see the bigger picture but no one has ever stated as convincingly as you have in this post. Thanks! You are right Matthew about illustration generally having different requirements. But think of a subway poster, billboard, book cover, or handbill. Those could need similar compositional considerations. Glad to hear you are getting some good ideas from the posts. Thanks for your feedback.